You are here: Home / Age of the Earth / The Salty Sea Part II: A Young Earth Salt Chronometer? Sodium also leaves the ocean via salt spray and ion exchange in a measured amount. If these rates were consistent throughout the past (a proposition that must be assumed), then salt accumulation can become a kind of clock used to measure the ocean’s age. We know how fast salt enters and how fast it leaves. It is apparent that the oceans have not yet reached equilibrium. Instead, they keep getting saltier every year. …..One of the strongest arguments for a young age of the earth is the amount of salt1 found in the oceans. If the world were billions of years old as the evolutionists and progressive creationists insist, there should be so much salt in the oceans that virtually nothing could survive in the enormous amount of salinity. Scientists have a good idea as to how much salt there is currently in the oceans. They can also calculate the rate in which additional salt enters the oceans; furthermore, because the salt does not leave the oceans very easily (this too can be calculated with some accuracy), the amount of salt in the seas is continually growing. Thus it is not hard to calculate at least a maximum age for the oceans (and hence a maximum age of our planet). The logic of this argument is so simple which is why I believe it still persists in the YEC repertoire of evidences used in general seminars. It seems like such a simple calculation: 1) Figure out how much salt is deposited in the ocean each year and how much leaves each year and you can show how much saltier the ocean must become. 2) Take that number and assume the rates of salt accumulation is constant over time (eg. Apply the YEC definition of uniformitarianism) and then 3) calculate backwards to determine when the ocean must have been fresh water and the earth could not possibly be older than this. 4) The next step is to produce a graphic and plug it into a PowerPoint presentation (see figure for example) and wow audiences with this proof that the earth can’t be a billion years old. a)Using sea composition to compute the age of the earth: Scientists used sea composition to derive the age of the earth. This method has its derivation from Edmond Halley (1656-1742). In his opinion, the rain would have dissolved all salt from the ground and would bring down to the sea with the assumption that there would be no salt in the sea initially. In 1910, George F. Becker found the age of the earth to be between 50 and 70 million years by means of salt clock method. However, the measurement by means of seawater composition does not give an accurate age of the earth on the condition if the sea might have been formed initially with much salt in the beginning. If that would be so, it is irrational to measure sea composition to determine the age of earth since much salt would have been in the sea already during its creation. This comment demonstrates the logic and rhetoric used by young earth creationists perfectly. First, he/she begins just as many YECs do stating that “scientists” use these arguments to assess the age of the earth. Well, it is true that Halley was a scientists in his day and he did use this method and that Becker did make some calculations using this method even in 1910 but what scientist in the last 100 years would use this method? I don’t know any. By the early 1900s further data collection and knowledge of chemistry and earth processes inform us that there is so much more involved in determining the life cycle of salts in the ocean and so today no ocean scientists would find the amount of salt in the ocean even a legitimate test of the earth’s age nor would they find the current amount of salt in the ocean at all perplexing. In the 1800’s scientists were looking for anyway to predict the age of the earth and didn’t have access to today’s technology and so one such estimation involved the buildup of ions on the oceans. To hold scientists to the exact methods used 100 years past based on very simple hypotheses and limited data collection is akin to holding scientists to accepting that the temperature on the surface of Mars and the chemical composition of that air must be what was calculated from satellites and prior to the landing of the Viking spacecraft on the surface. Even that lander was only equipped with crude, by today’s standards, instruments for measurements. Then when the Viking spacecraft landed a small craft on the surface our measurements were improved but Curiosity has far better instruments and we have learned much more about the geology of Mars so our estimates today would be considered far more accurate than those of the past. The salty sea argument can be likened to holding science to what it knew 20 or 100 years ago and saying that any improvement in our models of earth’s history and understanding of fundamental processes of chemistry since then doesn’t count. Here is a present day location where salt is being lost from water. The Dead Sea is a super saline body of water and salt crystals form in the water and fall out or form at the edges of the sea as more water evaporates. We will look at other places like the Dead Sea in the next post to see how even larger volumes of salt have been lost from the ocean’s in the past. These sorts of losses are not part of the YEC calculations for lost salt. By 1930 radioactive dating methods had been developed which indicated that the age of the earth was longer than anyone had anticipated. Many scientists became convinced that the earth and the ocean are billions of years old. These scientists could no longer endorse Joly’s method which they recognized “…leads to the spuriously low geochemical age”. This is Austin and Humphrey’s only reference to Livingstone’s article and really they say nothing about the actual content of his article nor address the issues that Livingstone brings up. Rather they have quote-mined the introduction for the phrase “leads to the spuriously low geochemical age” as if to imply that a salt is a valid chronometer for determining age and that it leads to an age that is lower than expected by “evolutionists.” Had they actually read the article they might have realized that much many of the assumptions of their own article has been shown to be incorrect more than 20 years before they did their analysis. Nevertheless, to an audience unaware of the results of many publications like Livingstones and Austin and Humphrey’s article appears to include a rigorously researched and detailed assessment of the inputs and outputs of salt into the ocean today. They conclude that more salt is entering the ocean than leaving. Since Austin and Humphries appeared to have done a thorough analysis and they are respected among YECs all YECs after this have simply referred to this paper as the authority and thus set the confirmation bias cycle into full swing. There has been no shortage of Christians who are scientists that have pointed out the errors of this approach and the gross misconceptions of uniformitarianism and other historical geological errors in reasoning that are involved. But this has done little to blunt the use of this argument in YEC seminars and pamphlets. AIG has a page with a list of arguments that YECs should avoid using or that are possibly dubious and there is nothing about salt here. Apparently they believe that this is a true and effective way to show that conventional geology has it all wrong. Have you spotted what is missing as part of this discussion about salt so far? If you were wondering where the data for how salty the sea actually is you are right. I haven’t provided data on that yet. Is the sea actually getting saltier? It is strongly implied in all these YEC articles that everyone agrees that the seas are getting saltier and that it is only a matter of assumptions as to how much salt was there in the beginning that changes the estimates of the age of the ocean. But are the oceans actually getting saltier? We will answer that question in the part III of this salty sea series. I enjoyed reading this! 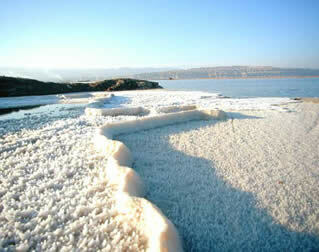 The image of the dead Sea is great. Keep up the good work. I look forward to part III. I understand this is an old post…but, perhaps you can help clarify a logical problem as it has to do with water and salt. The water observation first – the surface of earth is composed of 71% water…where did this water come from? If we assume that comets brought it to our planet, then, based on the known chemical composition of comets, it had to begin as “fresh” water and the salt component was washed off the solid material as it flowed to the oceans. Thus, the oceans have gotten “saltier” over time. If, as some claim, the water has simply “always been here” then we can claim that so too was the saltiness of the ocean…but, then our moon, according to scientist, would have destroyed all the water on the planet at impact. Then there is the salt component – NOAA – on their website, states unequivocally that all salt in the oceans came from water flowing over the land. Thus, supporting the fact that the oceans have gotten saltier over time. Both of these arguments lead to the possibility of a salt chronometer. If I’m talking to a YEC, how do you reconcile these factual claims by renowned scientist and make a valid scientific argument against this logic? Is there data to support this claim? Those are good questions. I’m not sure my answers will be very satisfying. I don’t know if there is a measure of ‘salts” in comet water. I suspect that even if we assume that the original water delivered to Earth (assuming that is even how it got here) were non-salty that original water would have soon become salty as it interacted with a very active volcanic early earth. Some equilibrium of salt concentratioin would have been reached very early. If that was a 3 billion years ago then the since that time salt concentrations have waxed and waned as the various imputs and outputs have changed causing changes in that equilibrium. Thus no salt chronometer as salt concentrations havent’ always been going up. Imagine a snowball earth time when much of the water was frozen. Then salt in the remaining water would have been very high causing much to precipitate out of the water and form halite. Then when the ice melted the oceans would have have much less salt than they do now but over time would have become more salty. In other words the salt chronometer has been reset many times in Earths history rendering its overall use as a chronometer not very effective. Thank you….but, you are correct. That’s kind of a “guess” of an answer especially since I’m speaking to an intelligent YEC. The “snowball” effect you are utilizing implies the mass removal of salt from the oceans into halite…and then the restoration of those salts in combination with runoff from the surface, thereby increasing the overall saltiness of the ocean through melting..correct? I agree that the salt chronometer is poor calculation of time…I’m just having a difficult time based on the agreed scientific evidence regarding salt that the earth is older than 100 million years. Even at it’s best case scenario, achieving a 4.5 billion year old earth makes the oceans too salty. Is there other factual scientific data I can refer too? Point them to this article: http://www.sciencedirect.com/science/article/pii/S0031018206002483 Talks about the evidence for past salt concentrations. 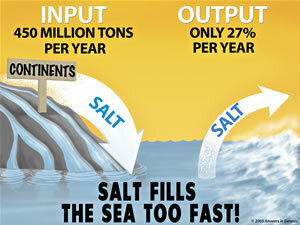 The data suggest that we live today in a time of less salt in the oceans than the past. Makes sense if the geological column is storing huge amounts of salt. Salt has been precipitating out of water more than been added to water over time. Given there miles think salt deposits in parts of world it only makes sense that there was more salt in the water in the past than the present. It had to be somewhere before being deposited in the geological column. Excellent. Thank you. You are a wonderful resource.